The Control Center feature of iOS offers quick access to some of the more frequently used settings toggles on the iPad and iPhone, like wi-fi and orientation lock. This is undeniably convenient, but not every user wants these toggles to be readily available to anyone who picks up their device, and in some higher security situations these functions may be considered inappropriate to have easy access to. If security is more important than convenience, consider disabling access to Control Center from the lock screen. This will prevent all lock screen based access to the toggles and functions of Control Center, so if you frequently use things like the flashlight from the lock screen, you probably won’t want to do this. 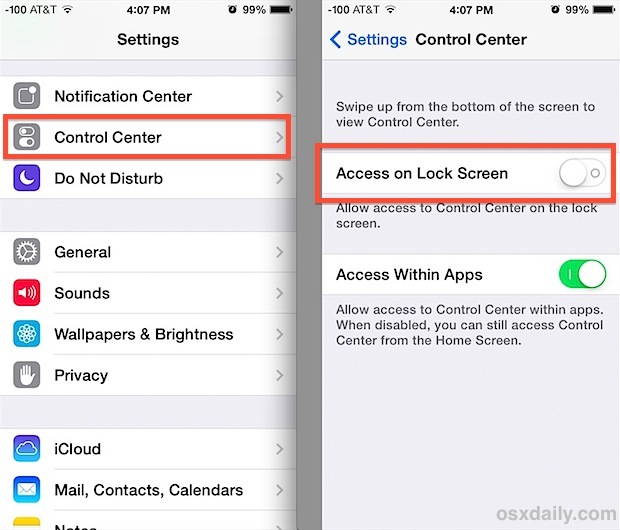 Disabling lock screen access does not turn off Control Center completely, it’s just that you will have to unlock the device, enter the passcode, and then access Control Center from the home screen or an application. This setting adjustment for Control Center and the lock screen applies to both iPad and iPhone, though where the setting is located depends on the version of iOS as it has been relocated in different versions of system software. 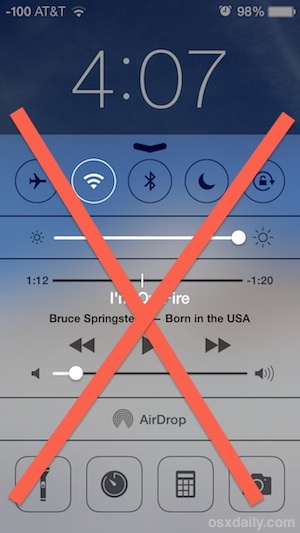 With this setting turned off, nothing happens when someone swipes up to bring up Control Center. You can test it out immediately by tapping the lock / power button at the top of the iPhone or iPad and swipe up. This is limited to Control Center and all settings and toggles within, including AirPlane mode, wi-fi, Bluetooth, Do Not disturb, orientation lock, brightness adjustments, music playing, AirDrop, the flashlight, stop watch, calculator, and the camera. For the camera, it won’t have any impact on the lock screen camera swipe-up gesture, though that can be disabled separately if desired. For users who would rather only have access to Control Center from the home screen of iOS, there is also the option to prevent it from showing up in apps. That setting is actually fairly helpful for gamers or apps that have a lot of swiping gestures, where Control Center can accidentally appear.